Few cities in the world can be swiftly summed-up with just the single name of a local artist. Yet when it comes to Barcelona, Gaudi certainly does the trick. As the embodiment of the Catalan Modernist architectural movement, Antoni Gaudi isn’t just a part of Barcelona, he is Barcelona. His fantastical designs greatly influence not just the face of the vibrant Catalonian capital, but immortalise its skyscape in the hearts of millions of tourists every single year. Even if you wouldn’t consider yourself a fan of architecture, you simply can’t go past a Gaudi tour-de-force when taking a walking tour of Barcelona; the master’s creations are considered more than mere ‘buildings’ but bonafide liveable works of art. From street lights to fountains, museums, homes, public parks, and, of course, La Sagrada Familia — his most famous beloved pride and joy — Gaudi’s Barcelona collection is not only impressive, but also quite extensive. Unless you’re an avid fan (bordering on obsessive), I’d recommend you set aside one full day for a self-guided Barcelona walking tour of the 5 must-see Gaudi treasures around the city. This will not only give you a great overview of the artist’s unique and quirky style, but will also offer the bonus of guiding you through a mix of Barcelona’s most distinctive hoods. Here are the 5 Must-See Gaudi Treasures in Barcelona (visit them in the order suggested for a day that will knock your socks off). View of the city from Park Guell, Barcelona, Spain. Mosaic of broken tiles in Park Guell, Barcelona, Spain. I kicked off my Barcelona walking tour in Park Güell and totally cheated by taking a metro ride (L3, Vallcarca stop) to save an hour’s steep walk uphill at the beginning of my day. Originally designed to be a privatised upmarket suburb, the funding project of Park Güell eventually ran out of gas (much like me by 4pm), and was converted to a public park instead, one that’s just brimming with Gaudi’s artistic touches at every turn. Take the western entry into Park Güell and follow the walking trail upwards, where you can soak up wondrous views of the city skyline and the three houses which Gaudi designed. You’ll need to buy an entry ticket to see the houses (in the southern section), yet admiring them from above and below are certainly rewarding enough. Follow the trail as it spirals down and you can pause to soak up the details of Casa del Guarda and the Dragon Stairway. 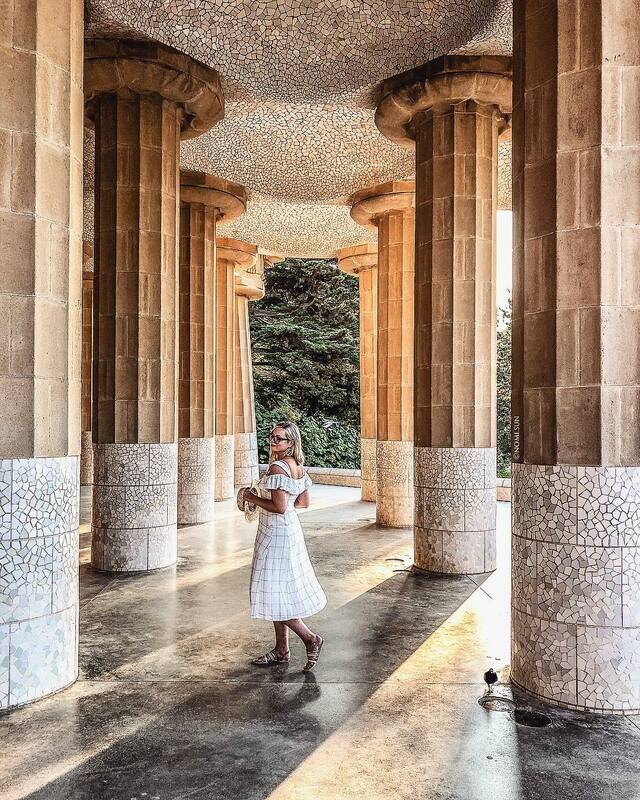 Don’t forget to pack a picnic lunch; the park is always buzzy, but this is one of the most relaxing spots in all of Barcelona and finding a quiet nook in which to rest and admire the views is supremely easy. As you exit Park Güell in the south, you’ll find yourself in Gràcia, one of the least visited yet most enchanting suburbs in Barcelona. Wind your way southwest through the narrow alleyways lined with charming plazas (and stop for a cafe con leche in one of the many charming cafés) until you reach Casa Vicens, a grandiose mansion designed by the master himself, and the second stop on our Guadi-inspired Barcelona walking tour. This was the very first house Gaudi built in Barcelona, yet because it’s only been open to the public for a couple of years, it still flies below the tourist radar. I loved the fact that I had this incredible place to myself for the first hour of my visit but, most of all, I adored the Moorish influence of Gaudi’s earlier works, which seemed to disappear later in his career. What has always been a constant, and is visible here, is Gaudi’s extensive and eclectic use of mixed material: ceramic, glass, and cast iron, always colourful and always used with skill. Lovingly restored and offering insightful guided tours, Casa Vicens is, in my opinion, one of the most inspiring Gaudi treasures in the city. A leisurely 20 minute stroll down Carrer Gran de Garcia on your Barcelona walking tour will take you to Casa Milà, contrastingly one of the most famous Gaudi-designed homes in Barcelona. The fabulous exterior façade of the house, known as La Pedrera (the stone quarry), is intricate and captivating enough, yet the exhibition room in its interior and the amazing rooftop terrace certainly warrant an entry ticket of their own accord. As with all of Gaudi’s works, Milà captivates both in its details and as a whole: you could spend hours on end trying to capture every minute detail and seeing how they all merge to complete the ethereal picture. Every column is unique and slightly slanted, the wrought iron work is magnificent, and the undulating balconies grant Milà an almost cartoon-like appearance. Casa Milà was the last private house Gaudi worked on before dedicating himself fully to La Sagrada Familia in 1912. It has been UNESCO inscribed, like six other Gaudi treasures, since 1984. Gaudi’s earlier works were mandated by Barcelona’s richest families, and so it was that he came to restore Casa Batlló for a prominent textile merchant. This is one of the most colourful Gaudi pieces of all, one that incorporates almost every style for which he became world-renowned: curved balcony detailing, extensive use of colourful mosaic ceramic, stained glass, stone ornaments, and intricate woodwork. Overall, Casa Batlló is a spectacular architectural vision and it seems almost preposterous to know it is over 110 years old. Take a guided virtual reality tour and you can experience and envisage the mansion the way Gaudi meant it to be, before it became the tourist hive it is nowadays with most of its furnishings having been removed for preservation. A unique insight into Gaudi’s genius imagination and a wonderful precursor to his most celebrated accomplishment. Aerial view of La Sagrada Familia, Barcelona, Spain. Interior architecture of La Sagrada Familia, Barcelona, Spain. Stained glass in La Sagrada Familia, Barcelona, Spain. The first glimpse I had of La Sagrada Familia caused my heart to skip a beat. I was two blocks away when the spires came into view above the grand buildings of Carrer de Mallorca, and they still managed to stop me dead in my tracks. Up close, this incredible architectural marvel is nothing short of jaw-dropping and, trust me, I’ve certainly seen my fair share of architectural treasures all over the world. In fact, I was a little skeptical of the Gaudi-hype before starting this walking tour around Barcelona, but, at the end of my day’s walk, had a sense that this would be an overwhelming experience. And it sure was. Everything about La Sagrada Familia is breathtaking — aside from the fact that it is incredibly imposing, its details are truly astonishing, and knowing this is one of the world’s top 20 structures that took the longest to complete simply adds to the appeal. The fact that the city is scrambling to have La Sagrada Familia completed by 2026 (to mark a century since Gaudi’s tragic passing) is testament to the dedication, and some would say lunacy of its intricate design. You’ll want at least 2 hours here, as a minimum, and some would say you could visit the now sanctified Roman Catholic Basilica many times and still discover new details. This is one of the craziest, yet most beautiful, man-made structures I’ve ever seen. The crowds are the only truly sobering aspect of a visit, but with a full-access ticket, you’ll soon learn to look beyond them and enjoy the multisensory experience. A true work of art, and the most beloved creation of a devoted and very religious man, La Sagrada Familia isn’t just a must-see in Barcelona, this is a bucket-list treasure everyone should see at least once in life. I recommend taking this walking tour as soon as you arrive in Barcelona. I left it until day 4 of my visit, and I was already fatigued from all the walking around on the previous days. In hindsight, I should have done this as soon as I arrived as I found this to be the most exhausting day of all — over 25,000 steps and counting! If you wish to explore any of the buildings’ interiors, you should buy your entry tickets online a few days ahead of time. This is especially crucial for La Sagrada Familia, the single most visited site in the entire country. If you’re travelling to Barcelona on a budget, then I’d say the only treasure you should splurge on is the most expensive (ahem, La Sagrada Familia, of course) which is absolutely worth every penny. A full-admission ticket costs $32, which will also grant you access to one of the towers and a super informative audio-guide, the latter being an unmissable addition. You will really get the most out of your visit when you learn all there is to know about Gaudi and his vision for this yet-to-be-completed gem whilst visiting it. If you indulge in nothing else in Barcelona, indulge in this! Choose a clear sunny day for your walking tour around Barcelona: Gaudi was a fanatic of colour and mosaic tiling, and his masterpieces sparkle to life on a sunny day. Let La Sagrada Familia be the last place you visit. There are three main reasons to do this: first, the church is west facing and, in the late afternoon, the sun shines through the stained-glass windows to create a mesmerizing rainbow of colours inside. Secondly, it is undoubtedly the most impressive Gaudi treasure of all — just when you think you can’t be any more impressed, WOW! Thirdly, there’s a handy Metro station below the church — in case you’re absolutely wiped out at the end of your long walking tour around Barcelona, like I was, you can simply take the Metro back to your hotel.